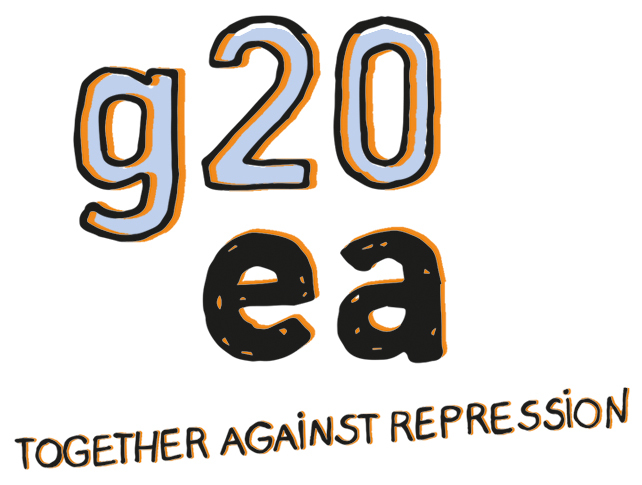 The #NoG20 team is doing a great job and is taking care of the 33 people who are still imprisoned. They need our support. Visit the link at the bottom of the G20 legal team statement to go to the Firefund page in order to donate. During the protests against the G20 summit in Hamburg the mainstream media and German politicians have painted a picture of activists and political protesters as enemies of the so-called progressive democracy. In the aftermath of the protests especially the social centre Rote Flora has been used as a public scapegoat. This narrative has effectively legitimised police brutality and repression towards left radical activists, alternative projects and self-organised, autonomous structures. Together with activists from all over the world we have already experienced great amounts of brutality and repression during the protests from more than 20000 disproportionately armed police officers. Both activists and the camps ruled legal by the highest constitutional court have been attacked, and also medics, legal teams and journalists have experienced the German police state in action. But the repression in Hamburg is not over yet. After the escalations by the police during the protests the city council of Hamburg is threatening radical left activists with further repression and possible evictions of self-organised, autonomous house projects, among others Rote Flora. 33 activists are still in pre-trial custody and we expect more arrests and house raids of activists, who took part in organising the legalised protests during the summit. Several influential politicians are even agitating for a central registration of “left extremists” and legal cases against activists organising the infrastructure during the protests, i.e. activists facilitating info points, soup kitchens, legal help, housing ect. This smear campaign is orchestrated by a collaboration between the police and politicians to delegitimise, criminialise and demonise all radical left activities or make the movement die out completely. This is a huge attack on the radical left and alternative cultures and communities in Hamburg. We expect a huge need to cover legal costs related to present and future police repression and brutality and we call for solidarity from our German and international friends to stand together with us. Make demonstrations at German embassies or consulates, put pressure on German authorities and help us raise money for legal aid through soli-bars/soup kitchens/parties and other collective and private donations.